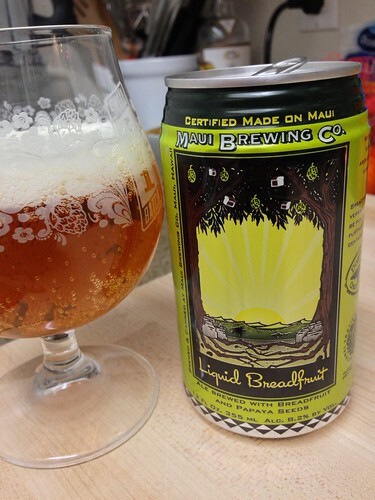 Maui Brewing Liquid Breadfruit, originally uploaded by adambarhan. A: Pours a hazy golden orange color with a small white head, rather foamy that reduces to a nice cap on top with some pretty nice lacing all around the glass. S: Some light tropical fruit on the aroma, mostly passion fruit with a bit of lemon/lime citrus and some bready malt. T: Not as fruity as the aroma, definitely a bit breadier. There is again a bit of passion fruit/papaya, but the citrus isn’t really there. A heavy dose of fresh bread comes through in the middle. M: Medium bodied with moderate carbonation. Pretty clean. Cool blog, keep up the good work! Keep posting cool infos about beer.